Decorating chalks are a lovely way to bring color to a stamped image. Decorating chalks are easy to use, requiring little in the way of special equipment, however they are extremely versatile. There are many ways that decorating chalks can be used, including dusting a color over an image using an applicator or brush, blending or layering to create new colors or painted onto an image using water and a paint brush. Their versatility combined with an accessible price means that these are an interesting addition to any rubber stamper’s work box. Decorating chalks are sometimes known as pastels or as decorating or coloring chalks. The compressed discs of pigment and chalk create a dusty color that is brushed onto paper to give a muted color. Most decorating chalks available for art and craft use are non-toxic and acid-free. The fact that they are acid-free means that the decorating chalks are ideal for use in archival quality projects where long lasting color is important. New innovations are being launched all the time in the crafting world. New decorating chalks are being developed and some recent launches have included shimmer or glimmer chalks that combine pigment with tiny specs of glitter or mica. How Are Decorating Chalks Used? Decorating chalks are used in a variety of stamping projects. One of the main ways that decorating chalks are used is to bring color to images that have been stamped in a single color using an outline stamp. Decorating chalks work particularly well with black inks as this accentuates the color, however other colors such as light grays or browns will give a more muted, aged look. Decorating chalks look good on art stamps and other stamps where gentle coloring does not detract from the beauty of the intricate stamped image. At the most basic, decorating chalks are applied to a rubber stamped image using an applicator. Most packs of decorating chalks come complete with applicators, however, these are very simple to replicate at home. Eye shadow brushes, cotton wool tipped swabs or small sponge-tipped applicators all provide ideal substitutes. Another way of applying decorating chalks is using a special applicator and small cotton wool pompoms. The applicator grips the pompom allowing new, clean applicators to be used or perhaps giving a different shaped applicator head. Even if the box of decorating chalks comes complete with more than one applicator, many people find that it is worthwhile keeping a box of cotton wool swabs to hand as this gives a ready supply of clean applicators for different colors and shades. Decorating chalks are readily available from stamping and craft stores. 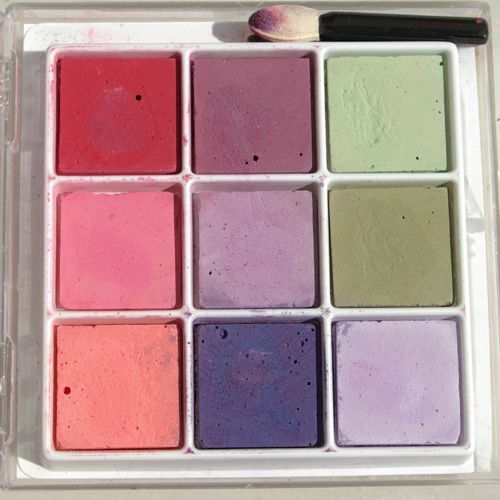 They are typically sold in palettes that include a number of colors. These are ideal for beginners to this technique as it allows plenty of scope for experimentation. Most palettes contain a few well-matched shades with large packs containing an extensive variety of colors. The gentle color does not require detailed application, meaning that they can be used to color a variety of images. Decorating chalks are easily blended giving a wide palette of colors. Decorating chalks are simple to use and beginner and novice stampers can create lovely finished images using little in the way of additional equipment. When decorating chalks are applied dry, it is possible to use dye inks that would otherwise run or smear. Decorating chalks will need fixing with a special fixative, although normal hairspray works equally well. Torn edges can be accentuated with a brushing of colored chalk.